Justin Ashley in his classroom at McAlpine Elementary School in Charlotte. Justin Ashley was a star teacher at McAlpine Elementary School in Charlotte. In 2013 he won state awards naming him “Teacher of the Year” in history and social studies. But his personal life was falling apart. Ashley says he had $100 in his bank account and a worsening prescription drug addiction. Meet teacher and writer Justin Ashley. He started writing about work-life balance for teachers as a way to achieve that elusive goal for himself. In the process, he turned his life around. 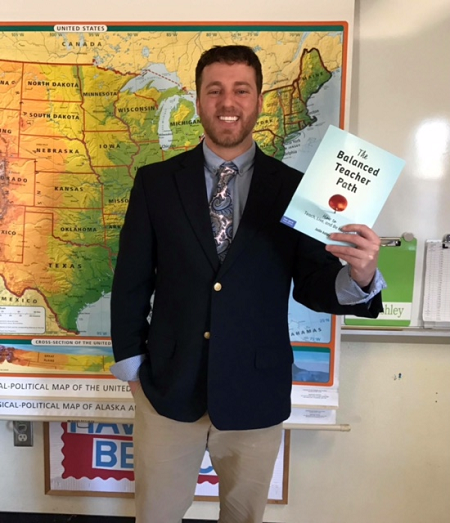 Now he hopes his book, “The Balanced Teacher Path: How to Teach, Live, and Be Happy,” (Free Spirit Publishing/2017) inspires other teachers to do the same. Host Frank Stasio talks with Justin Ashley about the teaching profession. Ashley now teaches social studies at Community House Middle School in Charlotte.